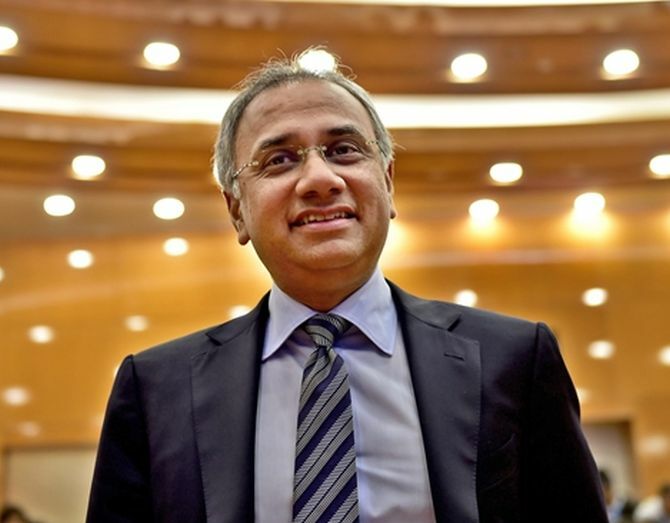 With Infosys emerging out of an uncertain phase, the new management, led by CEO & MD Salil Parekh, is trying to catch up with market leaders, with the new strategy in place. What has been your focus and what are the changes you are seeing on the ground? I have been travelling intensively in the past few months, meeting clients, investors and employees. I have met around 80 clients and 100 investors to understand their views about the company and our capabilities. We broadly have two groups of clients - new age firms who are disrupting businesses, and those who have been facing the disruption. The good thing is that both are looking for massive investments in tech, though the requirements are different. We want to make sure that we build more capacity and capability to partner with both groups and drive value to them. While 28 per cent of your business that falls under the digital basket is growing faster, close to 70 per cent, focused on traditional services, is hardly growing. Not a concern? If you look at our core (traditional) services business, we still had positive growth in the past quarter. The areas where we had negative growth was in our India business, which is not really a core service. That has its own cycle, which will come back, and we aren't overly concerned about it. Then, we need to expand our consulting business and stabilise our China business, where we are doing well now. FII holding has come down by 4 percentage points from March 2017 to 34.87 per cent at the end of Q1 FY19. Is there a trust deficit? We already have a large non-Indian investor base. Over the past six months, they have done quite well with their investments in Infosys. The way we are strengthening our capabilities and driving digital growth, there is a greater appreciation of the fact that we are building a business for the future. And, as that happens, I assume that some of these trends will automatically start reversing. Experts say a major dilution in the firm’s strategy is your willingness to sacrifice margins for growth. Is this true? I will absolutely not sacrifice margins (for growth). In fact, it gives me pride that we have a business that is generating good margins. What we are doing is in the context of where the market is. There are two elements that need attention. The first is digital. We are trying to expand the capability in a $160-billion market that is growing at 15 per cent. So, we could easily double our size in that market. The second is that we have to be clear that we are looking after our people well. There were some things that were not done fully in that front in the past few years, and I decided we should catch up quickly. It has nothing to do with sacrificing margin to get growth. How do you plan to get old profitability numbers back when the cost base rises? Today, 28 per cent of our business comes from the digital segment, and the margin of that (digital) on an average is higher than the company’s average. If we can manage to sustain that and that becomes a larger piece, our margins should look as healthy as they look in the digital segment today. In the consulting business, we already have a large practice. What we are doing now actually is fine tuning it to make it even more efficient. The good thing I found at Infosys is that we’ve a strong bench of leadership talent who are hungry to prove themselves. We are filling many vacant positions and new demands with internal candidates. I have been spending time with people who have been with the company for 20-25 years. We also recruited 20 senior executives in the ranks of vice-presidents and above to strengthen our teams in digital and large deals. These are the people who are going to build the Infosys of the next 10-15 years along with the existing team. I did not have any difference with Ranga. We maintained a good equation during the last few months that we worked together. He was part of the team that built this strategy. In that sense, he had a very successful run here, and now he wants to do something different. Why are we not seeing any large deal wins, like those that your rivals closed recently? Last quarter we announced large deals worth over a billion dollars. One of the areas that we are investing into is building the team that will help us drive such deals. Hopefully, in the coming quarters and years we will see more such things (large deals). How is your equation with the founders, especially N R Narayana Murthy? I have been fortunate to meet Mr. Murthy a few times at social functions. We had opportunities to discuss many things including the kind of works he's doing in the NGO space, especially in education activities. I have also met many other founders at a number of social events. And of course, since Nandan is in the board, I meet him quite frequently.